From where I sit, a winter storm rages. Waves are silenced by a thickening sheet of ice bringing great expectations for the ice fisher people. I move to my studio with my wave memories and anticipation of images to come. Next step #Blank Canvas: For small pieces like this one I choose 160 lb hot pressed watercolor paper (smooth surface). 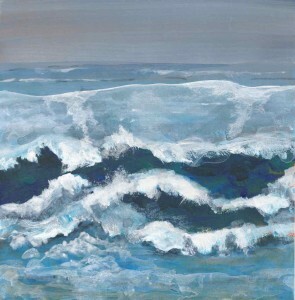 I like the way the paint flows for waves. Large pieces of this paper tear easily into 5 x 5 inch squares. Watercolor and acrylic paints, mixing surfaces, fresh water in containers, brushes and brain are all ready.